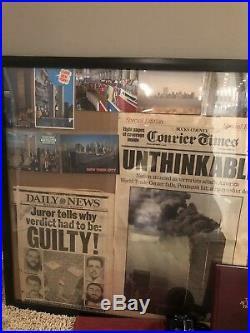 My World Trade Center Collection. Up for sale is the following from my collection over the years. 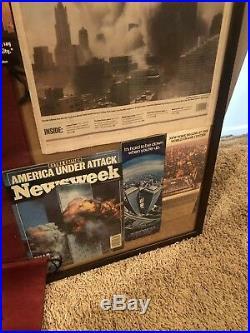 4 news papers-3 of which are dated 9/11/2001 the day of the attacks and 1 1994 paper from the bombing attack good condition. 3 vista hotel shoe bags very good condition. 1 observation deck ticket which is a little faded but still readable dated 8/28/2001. 1 actual key from the World Trade Center (world trade center do not duplicate). 1 emergency pass from the mayors office. 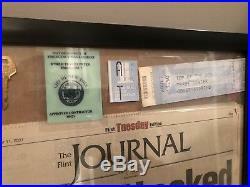 1 observation deck ticket stub. 3 photos- 2 inside of towers and 1 of the towers. 4 post cards all in like new condition. 6 brochures- they vary from like new condition but the blue one(its hard to be down when your up)is falling apart pretty bad. 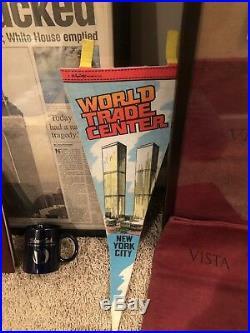 1 World Trade Center pennant with a 1975 date- no tears but quite a few creases towards the lower end. 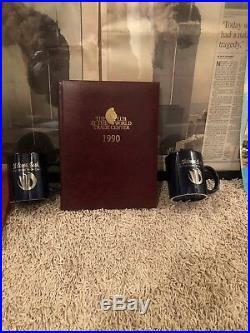 2 welcome back mugs that are in excellent condition. 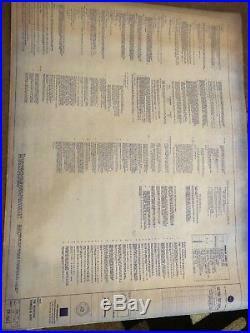 1 blue print of some type of plans from one of the floors- may be a lead copy of an actual print or is a authentic paper copy I do not know if it is original or not. 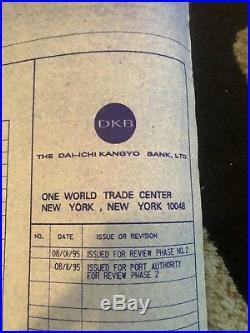 1 the club at World Trade Center executive desk diary in like new condition (I would almost consider it brand new but you base your own on opinion). 1 Newsweek magazine about the attacks. I will answer any question. Your package will not be in the frames but will be well packaged. 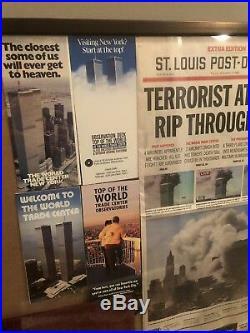 The item "My World Trade Center Collection" is in sale since Saturday, January 19, 2019. 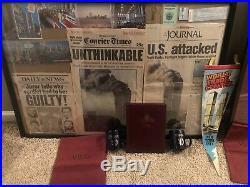 This item is in the category "Collectibles\Historical Memorabilia\Fairs, Parks & Architecture\Buildings". The seller is "unc_natha" and is located in Clearfield, Pennsylvania. This item can be shipped to United States.